That being said, it would be helpful to mention more about the scope of the project. Tiling a backsplash is a great first project for skilled learners, but cutting in tile for a bathroom floor takes professional skill and tools to do the job properly. Floors and walls typically arenâ€™t square and many of the tiles along the floor, walls and ceiling need to be cut with a tile saw. And donâ€™t forget about cutting around openings for pluming pipes, heating and electric outlets. Fun! Personally I love doing tiling, but itâ€™s long hard work and depending on the size and weight of the tiles and could be frustrating or super fun. There are some very good DIY videos out there. Good luck! I own a local home improvement business, MacFee Home Services, but am not your typical contractor. I pride myself on exceptional customer service and would be more than happy to work with you on your tiling project! I'm patient, dependable, and offer reasonable rates. If you're interested in discussing further, please feel free to be in touch or visit my website to set up a consultation. Thanks so much! The kitchen right now is down to the studs and getting drywalled. There are no cabinets yet, so other than cutting for the walls, there would only be cuts for plumbing and the outlet for the stove, but these would be under the cabinets, so they won't need to be precise cuts. No backsplash it planned right now. 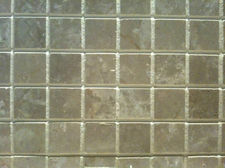 Planning for 12x12 or 18x18 tile on the floor. For the bathroom I want to do a mesh mounted hexagon tile. Since this won't require a tile saw, this is the room I'm debating doing myself. Then I really just need to become comfortable with prep and grouting.